wanted a special piece made for him. The Awen is an ancient symbol attributed the the Druids of old. solid and inlaid with amber. giving the impression of emanation from the dots and rays in the center. specially mixed to replicate amber. hung by sterling chain and wooden beads to accent the piece. please visit my How to Order Custom page. and sent them to me for a special line of Jewelry. One of them is the Awen. three staves emanating down from three acorns. an oak leaf curled to hold the chain or cord. “Merlin” or Kirk McLaren of Amulets by Merlin. 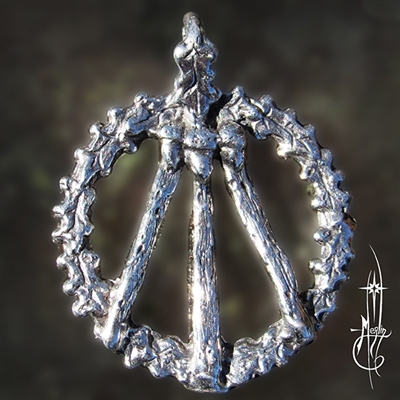 You may purchase the Awen Amulet and his other designs through my site. and clarity to the world. his writings and more, you may visit his website. 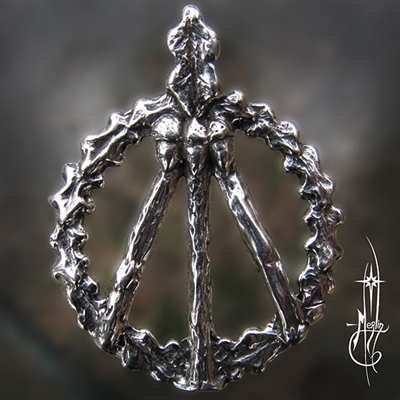 A Larger version of this amulet is now available. is an ancient design used by the Druids of Olde. brought into manifestation in the material world. and many other followers of Druidry. 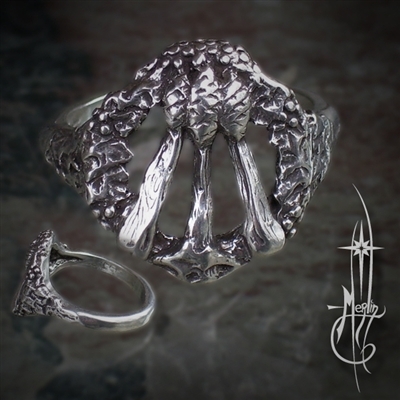 I have received numerous requests to create a Winter Awen Ring. the leaves are of Holly, the “dots” are pine cones. and a cluster of berries crown the top of the piece. the Holly covers the stave and it appears below. only to re-emerge “un-looked for”; the triumph of the Light. please visit my Awen Ring page. and from it three “rays” of light. with this classic symbol of the Druids. illustrating the dots and rays of emanation. for every one of the Bonewits collection. I have made a “Winter Awen” version featuring pine cones and holly. I can also add a patina to “green it up a bit” and enamel the berries. This design is available both as an amulet and a belt buckle. this is the page for you! 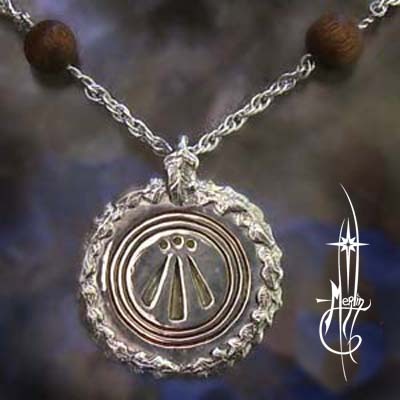 The Awen is an ancient design used by the Druids of Olde. both an Winter Awen Amulet and this Belt Buckle. however he wanted to have a different version. From his description I changed the leaves from Oak to Holly and included the berries. I exchanged the acorns for pine cones and the staves match the cones with pine wood. the Triumph of the Light. in the “special instructions” option of the page when ordering. 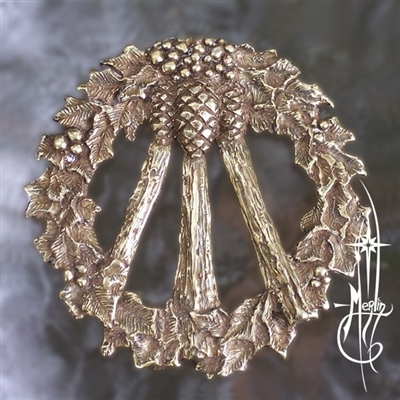 please visit the Winter Awen Belt Buckle page. The Awen is an ancient design used by the Druids of Olde. This symbol has been recognized and harnessed by the Neo-Pagan movement to symbolize the emanation of the Light, brought into manifestation in the material world. A Druid who loved the original look of the Awen designed by Isaac wanted to have a different version of the piece. From his description I changed the leaves from Oak to Holly and included the berries. I exchanged the acorns for pine cones and the staves match the cones with pine wood. In the original design, the central “ray” of the Awen is exposed, here in the new Winter version, the Holly covers the stave and it appears below. This additional feature reflects the idea of how the light is obscured in the Winter only to re-emerge; the triumph of the Light. 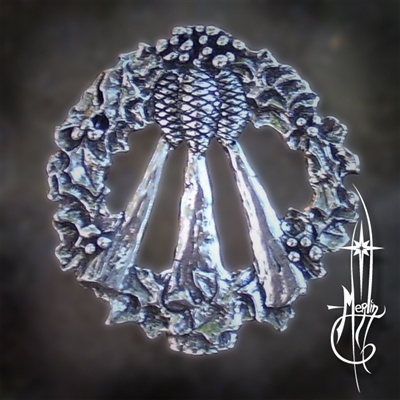 The Winter Awen is one and a half inches tall, considerably heaver the the Large version of the Awen designed by Isaac; the bail is behind the cluster of berries to be hung by a chain or cord. If you wish, I can enamel the berries for a more festive look. To get your copy of this piece, please visit the Winter Awen Amulet page. A few years ago I created Jewelry for Isaac Bonewits. 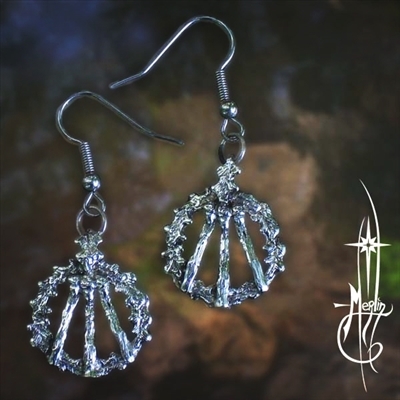 He developed renderings of several designs and sent them to me for his special line of Jewelry. three staves emanating from three Acorns. curled to hold a jump ring for a Shepard’s hook earring. he even created a special portion of his website to feature the work. I have continued to produce his line for him. and encourage in efforts to promote good will and clarity to the world. you may visit his website.